The project by Massimo Bottura to feed Milan’s poor using food waste generated from the pavilions of Milan Expo is helping to raise awareness about the problem but is also the start of something that could be much bigger than what Massimo Bottura might have imagined. He says that interest in this project is growing to the extent that there could be a ‘Refettorio Ambrosiano’ in New York and one in Lima. “Daniel Humm left this place with tears in his eyes after he came here. He was emotional and said he wanted to take this project with him to New York. Gaston Acurio, the Peruvian chef who will cook at the Refettorio towards the end of June said this is such an extraordinary project that he wants to have something similar in the poorest quarters in Lima,” Massimo said. 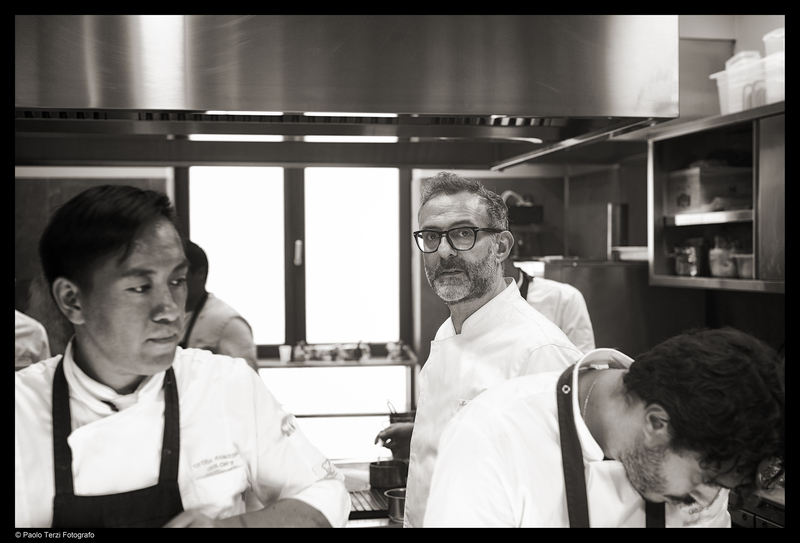 Massimo Bottura is the chef of Osteria Francescana in Modena, recently voted 2nd world’s best restaurant. We have already urged our readers to help Massimo in this project by donating. Trust us, this is a worthy cause. You can find the link to donate to this project here. Scatti di Gusto has a video (below) of Massimo describing the project. It also lists the chefs (both Italian and international) who will be cooking voluntarily at Refettorio Ambrosiano (it is in Italian so we are taking the liberty to translate it). He uses a metaphor to explain how an artist wanted to create a work of art using 100 million sunflower seeds. He helped people from a whole village to work towards this aim. For many years, the people had no work because they had previously devoted their life to working for the emperor. So the artist helped to save the village by enabling all artisans to work and create these 100 million sunflower seeds. “If we use our knowledge and our culture to generate awareness and to make people more responsible we can lead the way. We want to show what we can do with dry bread, a potato skin, with a chicken carcass, with milk that may expire tomorrow. Like this we are setting an example for the whole world,” he said.